Disparate: If one side makes a move with a piece of type “x” (black, white, neutral, half-neutral, etc., King included), the other side cannot answer immediately by moving a piece of the same type “x”. 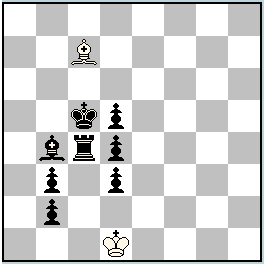 (For example: white Qc1, black Ka8,Qa7 – mate in 1 move. After 1.Qc8#, Black is mated because 1…Qb8? is illegal. The mate is possible also with the neutral nQc1 – after 1.nQc8#. Black cannot move the same neutral Queen.) Every Pawn’s promotion is a Pawn’s move, therefore after such promotion (into any possible piece) the other side cannot answer immediately with its Pawn. We can say that after the move of the figure of type “x” any enemy figure of type “x” falls under Half-moving paralysis. This paralysis disappears immediately on the next half-move, if the opponent plays with another piece of type “y”. This is the main version of Disparate (the programmer is Stephen Emmerson), that is presented only in Popeye (starting 4,53 version), and answers to the definition of the inventor Romeo Bedoni (2004) and to the requirements about this condition of the editors of “Phenix”. Using Popeye‘s version of Disparate in 2010 was organized a big international tournament Bedoni – 80 Jubilee, with results published in the magazine “Phenix” – No.191-192/2010. In the same number was also published a big article by Petko A.Petkov about Disparate, dedicated to its inventor Romeo Bedoni. Important note: Disparate condition is not included in Popeye‘s manual, but it is implemented there and can be used as “Disparate“. Another version of Disparate you can find in WinChloe, but it is based on the different rules. Creation of a special Disparate batteries: in the first solution the both black Bishops (Bb4&Bb5) are paralyzed because of the Disparate half-move paralyzing effect; in the second solution the both black Rooks (Rc4&Rb6) are also paralyzed analogically. The important moment of the main theme is another paradoxical motive – blocks of the squares around the black King by the white pieces which change their color to black! Model mates. Nice paradoxical battery mates. The Disparate fairy condition is very interesting. Petkov has brought out the essence of the condition with imagination. Thanks Petkov. Congratulations on your wonderful problem which have a great impact on me! Maybe can do something with this schema?! In a): On the second black move a black piece R changes its color to the white, but there’s no self-check because of Disparate condition – if a black Rook has just moved, then the same white piece can’t do the next move! But AFTER the next white move it IS check! I’d call it “deferred self-check” :). So, while the white is waiting for its wR piece to lose its paralysis, it prepares the mating picture. It is a move by the wB, which has three functions: blocks the black King, changing color to the black; the same time paralyzes itself and bBb4 so they can’t defense the King on the next move; and the same time unparalyzes the wRc1! Now the wRc1 checks the bK, but the black is paralyzed to defense himself. The last move explains why the only possible promotion on the first move was into B! In b): The same thing, but this time the wB is waiting for its chance to check the King. The wR blocks King’s square, changing color to the black; paralyzing itself and bRc4; and giving time to the wB to loss its paralysis. This time it works with only promotion into R! The idea is reminiscent of Petko’s many (wonderful) examples of neutrals in Disparate: Black (or White) can put himself into an apparent self-check which is in fact only a deferred self-check; on the next move, it turns into a real check. The difference is that with neutrals, the deferred self-check comes from a piece that is black and white simultaneously; in Anti-Andernach, it comes from a black piece that turns White! Here is a 2-solution one. Very nice, but with Disparate it is almost cheating to use a knight to mate a royal knight!